Sacred Hearts Academy - The Blog: In Loving Memory of Sr. Julie Louise Thevenin, ss.cc. In Loving Memory of Sr. Julie Louise Thevenin, ss.cc. SR. JULIE LOUISE THEVENIN, SS.CC. Sr. Julie Lousie Thevenin (Violet) died peacefully in sleep on Tuesday, January 26, 2016 at the convent of Malia O Ka Malu. She was 97 years old. Sister had been hospitalized for a time, but was returned home under hospice care. 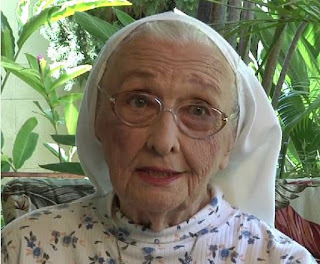 Sr. Julie Louise was born on September 18, 1918 in Honolulu of Alfred Joseph Thevenin and Maile Elizabeth Cowan Thevenin. 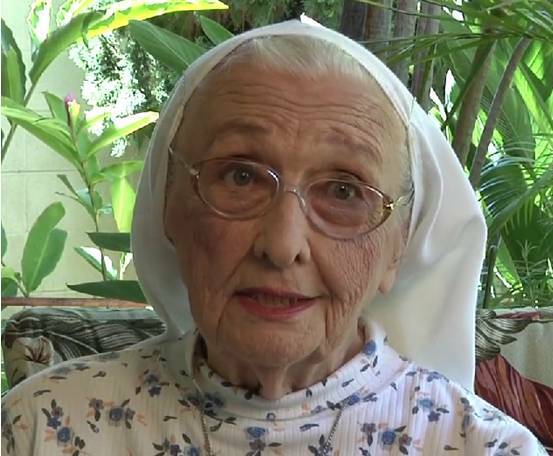 Sr. Julie Louise attended Sacred Hearts Academy and graduated in 1936. She entered the Congregation of the Sisters of the Sacred Hearts of Jesus and Mary in 1938 and was a teacher at Sacred Hearts Academy from 1940 to 1959. She also directed the Girls Scouts Program, was responsible for the Athletic Club, directed the Junior Red Cross, was the advisor for the SHA Audion Yearbook and organized the school’s annual Fair. In 1959-1960 she did Art Studied in Paris, France. In 1963-1968 she taught at Sacred Hearts Academy in Fairhaven, Massachusetts, then in 1968 she was teacher, then principal at Maria Regina School in Gardena, California. She returned to Hawaii in 1982 to continue teaching until her retirement in 1984. Although residing at Regina Pacis, she continued to be interested in the activities of Sacred Hearts Academy. She used her artistic talents to paint pictures that were sold at the Academy Gala each year. The Gala was a means of raising scholarship funds to assist students who needed financial aid. Illness in 2014 prompted her to be retired to the congregation's central Infirmary at Malia O Ka Malu, however in 2015 Sister celebrated her 70th Jubilee of Religious profession as a Sister of the Sacred Hearts. She continued her contact with many of her students both here in Hawaii and also on the mainland. Sr. Julie Louise was an advocate of peace and justice and often spoke out about what she felt needed to be corrected or addressed. True to the charisma of her Congregation, she brought all of these concerns to the Lord in Eucharistic Adoration. She is survived by her nieces ,a nephew and numerous cousins and friends. Funeral arrangements are being handled by Nuuanu Memorial Park. Services for Sr. Julie Louise will be on Monday, February 8th at the Sacred Hearts Academy St. Margaret Mary Chapel (Directions). Public viewing will be a t 9 a.m. with rosary at 9:30 a.m., eulogy at 11:00 a.m followed by Eucharistic Liturgy at 11:30. Burial will be at 1:00 p.m. at Hawaiian Memorial Cemetery. In lieu of flowers please give a donation to the Sacred Hearts Academy Scholarship Fund.